The back page of The New York Times' Arts section was almost entirely filled with Kotaku game reviews today. Thankfully, that wasn't a printer's error. 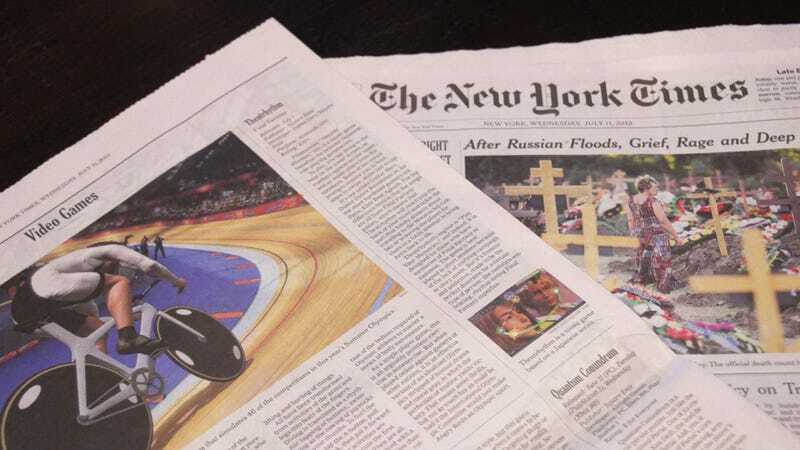 We are partnering with the Times to provide the majority of the paper's video game reviews and cultural commentary. Going forward, readers of the paper can expect to see monthly round-ups of condensed, edited Kotaku reviews as well as original full-length reviews and essays written by me. The partnership is both a testament to my colleagues' work here at the site and to the Times's continued insistence on publishing relevant and interesting writing about video games. While our reviews will be shortened in Times, this arrangement won't change the way we review games here at Kotaku. We do hope it brings a few curious Times readers to these parts, and I hope current readers will make them feel welcome. Look for our first round-up, consisting of reviews of London 2012, Quantum Conundrum, Theatrhythm Final Fantasy, SimCity Social, The Amazing Spider-Man and The Walking Dead: Episode Two on the back page of today's Arts section. Or read them online, to get a look at the Times version of our words.